Dinermite Diners, NEW Diners for Sale. We sell and manufacture America's NEW Stainless Steel Diners. If you are searching for new diners for sale you have come to the correct website. 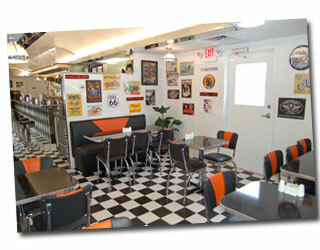 We have over 50 years of diner sales experience in the United States. 50's Diner sales to Canada, Mexico, Panama, England, United Kingdom, UK, Germany, Italy, France, Greece, Japan, Hong Kong, China, Australia, Taiwan, South Korea, Sweden, Switzerland, Russia, Poland, Australia, New Zealand, Belize, Ireland, Netherlands, Spain,Belgium, Ecuador, Phillippines, Denmark, Indonesia, Portugal, etc.. Please view our diners for sale listed on our menu tab to the left. We have included diner equipment schedules, floor plans, and many images of both the final product and the assembly process. 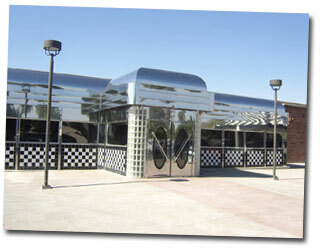 Dinermite Diners is the leading seller of modular classic stainless steel diners and is based in Atlanta Georgia. Our modular design offers a lower cost and easy location or relocation in the future. View our DINER INSTALLATION page to see how we ship and set up your NEW stainless steel diner. Click here to view diner installation Gallery. We sell the Silver Star Diner, Silver Eagle Diner, Silver Eagle Star Diner, Silver Eagle Junior Diner, Dinermite Classic Diner, Classic 120 seat Diner, Classic 140 seat Diner, Classic 160 seat Diner, and any custom diner or restaurant required by the client.